I’ve only reviewed Applebee’s once before, since I’m mainly there for half-off appetizers and drink specials. They do have a pretty varied menu though, with a couple of interesting sandwich and burger options. One thing I don’t understand is why they call their tortilla-based sandwiches “rollups.” We already have a word for that, guys. It’s called “wraps.” Try it, it makes you sound like you’re not in second grade. Anyway, I decided to try the Oriental Chicken Rollup, and while “oriental” isn’t helping Applebee’s word choice decisions any, it was pretty good. The rollup includes fried chicken, “Asian greens,” which are a kind of a slaw that includes a lot of red cabbage and carrots, and almonds, with a light Teriyaki sauce. It has a full flavor and nice texture without any one element being overpowering. I’m a big fan of Asian fusion wraps and sandwiches, and this is a pretty good one. It’s also big enough to be filling, and I actually brought half of it home (a rare admission of defeat for me, but I had eaten earlier). The Oriental Chicken Rollup is a little over $8 with fries. It’s definitely a good meal, although generally if you’re going to Applebee’s you should splurge for steak or something else big. However, if you want a nice chicken wrap with a somewhat unfortunate name, this is the rollup for you. Applebee’s is a family restaurant/bar known for their appetizer specials, trivia nights, and all around ubiquitousness. They have a number of burger and sandwich offerings, and looking back through previous entries, I was surprised to discover I haven’t reviewed anything of theirs yet. Well, that changes today. Among their various and sundry appetizers they have a cheeseburger slider platter, which comes with fries and can include bacon for an added fee. It's three, three, THREE times the tiny cheeseburger!! 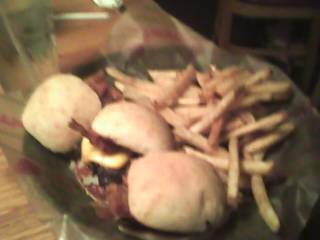 The sliders consist of a small patty, cheese, diced onions, Applebee’s “signature burger sauce”, and bacon on a ciabatta-type roll. I’ve mentioned before that I’m not usually a big fan of sliders, especially when they’re presented as a full meal option. Applebee’s wisely avoids this problem, and as an appetizer/light meal, I really enjoyed them. The patties were good, and although there was only about a half-strip of bacon on each, it really made a difference in the flavor. The sauce was good too, it was somewhere in between a regular A1-style steak sauce and Steak and Shake’s Frisco sauce. The ciabatta roll was a nice touch, it added a sense of elegance to the burgers which a mini hamburger bun couldn’t have. The Cheeseburger Slider Platter costs around $7, with an additional 50 cents for bacon. However, Applebee’s offers nightly half off appetizer deals, which I would highly recommend you take advantage of. It’s a great appetizer, and with another small order it could make a great meal.